How is the reader invited to see through ‘reality’ to the supernatural explanation of events (i.e., the Selkie legend)? Consider, for example, Jake’s first meeting with Jessie (p.43) and her apparent knowledge of his fall into the water (witnessed only by a seal, p.37). The prior meeting between the two (while Jessie was in her seal form) is hinted at by Ted with a slip of the tongue (the first of many): “‘Ah, she’s a shy one, that one,’ said Ted. ‘Cheeky too, as you’ve seen.’ He coughed. ‘Can see. '” (p.43). Why hint at the supernatural, but not reveal it from the start? What qualities of character make Jake able to see the (supernatural) truth of things (when adults like his Dad can’t)? In what other ways does Jake’s character shape this story? Does his character change during the course of the story? How is ‘story’, as a concept, treated in the novel? Consider Jake’s discussion about the Selkie legend and believing in things (pp.122-130). Why have Jake’s father retell the Selkie legend (pp.122-130)? I think it works to have the reader ask – as Bob asks (in his Bobs Books Blog) – Will the legend be repeated?! Inviting the reader to wonder this leaves the reader uncertain of the ending (of course), but it also has the reader engage with the legend, …so why have readers engage with old legends in this way? Are legends still meaningful and useful to modern audiences? In what way? I haven’t developed this thought in any particular direction yet, but I am interested in the character of the old man (Ted). Why this character? Why a lonely old guy living in an isolated cottage? What does such a character add to the story? When I first encountered him (Ted), I was put in mind of The Loblolly Boy (James Norcliffe), which relies on a similar character for the telling of its tale…. Bullying / victimhood: early on in the novel, the protagonist, Jake, thinks about how he is being bullied at home in Auckland (pp.30-31) after failing to stand up to two older boys who are abusing a local dog (p.28-31). Jake explains that one of the reasons he is bullied in Auckland is that he “live[s] in a make-believe world” (p.31), but this ability to live in a world of make-believe proves to be what enables him to save the day (and his father) in their encounter with the Selkies. As Jake learns about the Selkies and works out how to rescue his father from the Selkie spell (and Cora), he also develops the courage to stand up to the two boys who bully him in Wellington (stealing his bike, hurting Jake and also abusing a local dog). Courage, truth, story and imagination are intertwined in this way… and connect with mankind’s relationship with animals at the same time…. 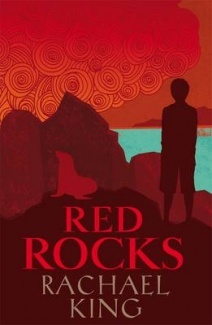 Mankind’s relationships with animals and the natural world (Consider also the exchange between King and author Philippa Werry about the use of Red Rocks as a setting – and King’s inclusion of fishing in this now protected area (http://www.philippawerry.co.nz/blog/2012/06/red-rocks-by-rachael-king/)); Des Hunt’s work, for example? Mindmaps help me think critically. They help me see the links between things and plot a course through all the observations and questions that a text provokes when I read it ‘as a text.’ This blog is a mindmap of sorts; full of random thoughts and relevant-seeming quotations or ideas. You can also use the search bar at the bottom of the page to see if a particular word/book/author/theme is mentioned. I have a section titled ‘Blog Notes’ in which I explain my blogging style. I have a ‘Literary Resources’ section which includes general ideas on literature and its study as well as the questions I apply to any text I study. These questions (eg. Character Questions) may be useful to any other reader wishing to look at this text differently (refer to very early on in the blogging history of this section). I absolutely welcome discussion: comments, suggestions, ideas, criticisms… please add them! Lilian Ida Smith Award 2005/ 2006. Hubert Church Award 2007 for Best First Book of Fiction, Montana Book Awards for The Sound of Butterflies. Ursula Bethell Residency 2008 in Creative Writing (Canterbury University). Long-listed for the IMPAC Dublin award 2010. Classed as ‘children’s/teenage general fiction’ and published by Random House, Red Rocks was only published last year so there isn’t much of a history (in terms of criticism, at least; King does explain how the story came to her on her own website). There are also interviews and reviews around the place, but little academic research has been applied to King’s work as yet (31 March 2013).